Since 1989, FICO has developed several generations of the FICO credit scoring formula. In 2009 FICO introduced FICO 8, their 5th generation credit scoring formula. FICO 8’s newest formula has been revised to enhance the credit score’s ability to predict consumer credit risk. FICO 8 has been available since 2009 and according to their website, 7600 creditors now use the newest version, FICO 8. This is not a big number. The former version of FICO is still the most widely used credit scoring formula. But, if your lender is using the newest version of FICO, consumers with good credit habits will probably see their scores somewhat increase, while consumers with poor credit habits might see their scores decrease. Consumers who max out credit cards will experience a lower credit score under FICO 8. I talk about keeping balances within 30% of your available credit limit all the time on Rebuild Credit Scores in order to improve your credit score. In case you ever doubted, this is proof positive lowering your account balance to 30% or less will increase your credit scores. FICO’s website says “if your credit report shows a high balance close to the card’s limit, your score will likely lose more points than it would have previously.” Now, more than ever, keeping balances low should become a habit if you are not already doing so. I have written about how one late payment can drop a good score by as much as 100 points and a less than perfect credit by as much as 30 points. Under FICO 8 if you routinely pay on time and your other obligations are in good standing, one late payment may be forgiven. But, if you have late payments with other creditors, FICO 8 will penalize you even more than the widely used FICO scoring model. It is expected consumers who currently have a low credit score will see it get worse once more lenders begin to use FICO 8. 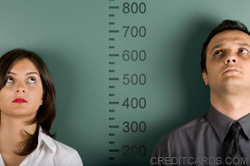 If you have good credit, your score may see an increase. FICO tried very hard to get rid of authorized user credit. Authorized user credit has the potential to increase a credit score, if the account holder has good credit. The authorized user gets the benefits of the account holder’s good credit without the financial responsibility. It is common for parents to add their children or spouses to add one another to an account. However, the authorized user benefits were abused for several years. Some companies began to sell account holder’s good credit to consumers with bad credit. Instantly and literally overnight a low credit score would increase. The practice was called trade-line renting. The company would charge a fee for the authorized user accounts and the account holder would receive compensation. The buyer of the authorized user account would never get an actual credit card from the account holder but they would reap the benefits of the positive credit accounts. FICO lobbied hard to end authorized user accounts but was unsuccessful; and, for good reason. Parents should be able to add their children and spouses definitely should be able to share the benefit of good credit. FICO 8 continues the practice of authorized user credit but has revised the formula to reduce any benefit of trade-line renting. The formula somehow detects a stranger being added to a credit account for the purpose of trade-line renting. Consumers that have collection accounts with a balance of $100 or less on their credit report will no longer experience the negative effects. FICO 8 ignores small-dollar collection accounts where the original balance was less $100. They seem to dismiss the 20 point discrepancy as no big deal. But consumers know 20 points lower can make the difference in approval or denial of credit; or, the difference in mortgage or car loan interest rates. Although FICO 8 is not widely used by lenders as of yet, the best way to combat any changes in your credit score is to pay your bills on time and keep your balances low. These tried and true credit habits will continue to help your credit score, no matter what version of the credit scoring formula FICO introduces.